As some of you might know, I had my big moving sale on Sunday! The one thing about almost any kind of travel is that you must. pack. light. I know some people don’t follow this rule when moving, but when moving consists of a major road trip in a mid-sized car, it’s a must! So I had a moving sale. 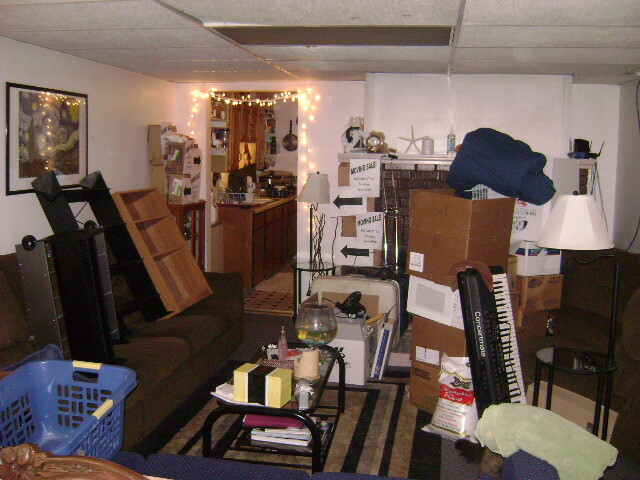 I planned it very carefully, too, as I knew it was my big opportunity to not only reduce my belongings but to make a little cash in the process (I really needed to see money in my hand before I forgot what it looked like). 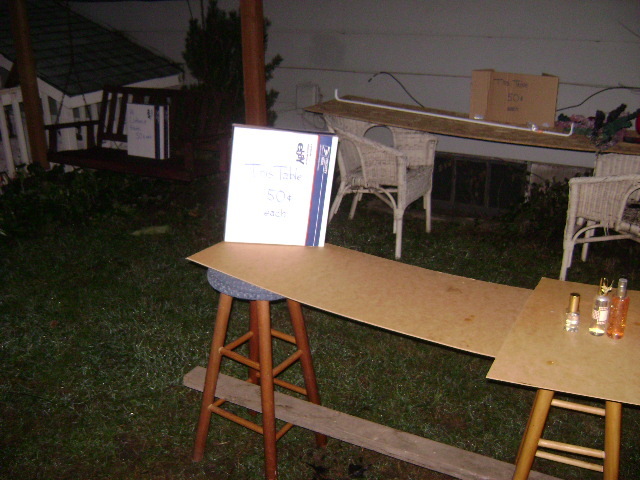 I advertised well, even paying to put an ad in the newspaper, went through all my stuff ahead of time, made a giant pile in the living room of boxes labeled “sell” and “free”. I cleaned up the bigger items, made some beautiful signs, bought hot chocolate to serve, and set up all the tables the night before. I’d been scared to death that it might rain that day, but my heart rate returned to normal as the weather forecast retracted its threats just hours before the big day. Everything was perfect and it was going to be the best sale ever. I was excited. I was even proud of myself. The frenzy was set to start at seven, and before I went to bed late Saturday night I set my alarm for five to give myself plenty of time to have everything set up before the customers began to arrive…..
Bzzz….Bzzzz- WHA?! I jerked awake at a buzzing sound from my phone on the desk. My eyes swiveled to take in the gleaming red numbers on my clock and as they did, my mouth let out a screech- Aaaaaah! OH NO!!!! It was 7:40!!! I was a full FORTY MINUTES late, not from getting up to set up my sale but from being at the START of my sale!! I. Was. Mortified. 😦 Jumping out of bed and throwing on clothes faster than I ever have in my life, I ran outside with a box of merchandise and started throwing stuff on the tables. During most of the worst tragedies of my life I’ve been able to imagine how funny the situation really is or at least what a wonderful story it will make, but this is one situation in which i honestly had a VERY difficult time finding the bright spot. I felt so irresponsible and ridiculous. 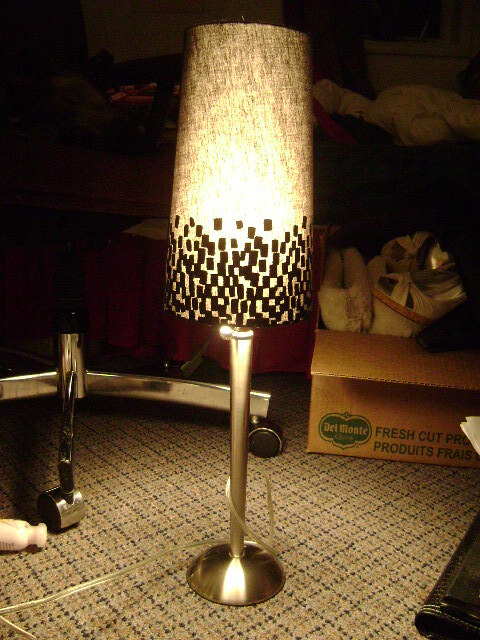 I traded my friend that plant for a really cool lamp! 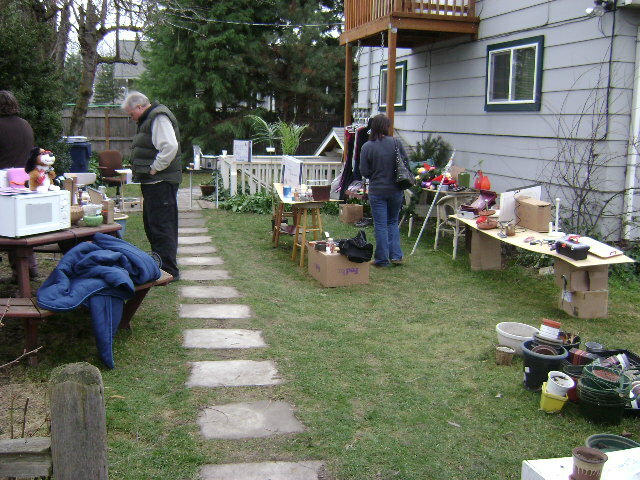 Not a soul was lurking around the vicinity of the yard and for a moment I thought that perhaps every yard-saler had lost faith in me and it was all a total flub. Perhaps the yard-sale community had already put me on their black list for what must have seemed like the cruelest moving sale joke in history. 😮 I winced as I tapped on the door of my roommate, whom I knew had only had a few hours of sleep, begging her to come help me. I needed someone to (wo)man my sale while I tried to haul my junk out the door. Thankfully, I have some of the best friends/roommates in the world and she willingly pulled herself from a deep sleep to go stand in the bitter cold guessing at what my prices might be for various items. Long story short, because my roommate handled the customers (which DID come, by the way, and fast), within about an hour I had everything out and set up in a rather chaotic fashion and felt ready to begin. 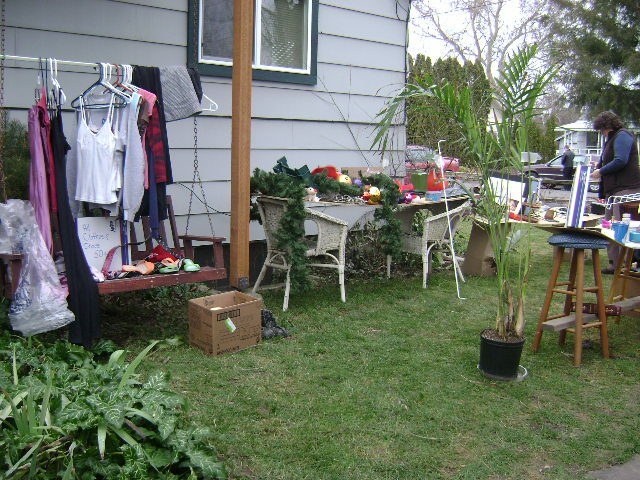 I had also sold about half of my larger items by then. I realized pretty quickly that there were still plenty of customers whom I hadn’t offended and that people really just wanted to buy stuff before I’d had a chance to take it out of the box or think of a price. One woman arrived about 2 minutes after I woke up and immediately bought my couch and 2 table-lamp deals. I realized that I really didn’t even need my street signs in order for people to find me. The only real embarrassment occurred during that painful window of time when I had large numbers of customers but only about 5 items for sale…..
My landlords joined my sale, adding a few of their items. Apparently, as they recounted to me later, there had been a HUGE crowd of people outside my house at 7am. They even knocked on my door and everything but…. we were SLEEPING! Get rid of all my crap…. CHECK! That’s one job down!